The science of small arms ballistics is seriously underdeveloped and underappreciated. This unique and different book is a comprehensive study that fills a legitimate need for a work that covers the engineering and theory of small arms ballistics. 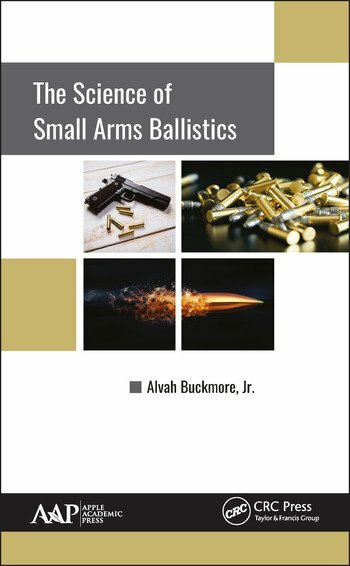 The author shares his extensive research on working out the science of small arm ballistics mathematically and explains his theories, such as the field-effect and the field-effect over trajectory and time, along with new theories on interior, exterior, and terminal ballistics. Each equation describes a mathematical relationship, such as transfer of energy, and has an engineering application to help solve a design problem. Some equations, such as the calculation of bullet length with a given muzzle velocity and rate of twist, represent manipulations of those equations. Some other equations represent a set of mathematical instructions to resolve a technical problem, such as the computation of trajectory or depth of penetration of living tissue in real-time. Alvah Buckmore, Jr., a United States Army veteran, is a self-taught expert on small arms ballistics. He has gained national and international recognition as a pioneer on this subject. He taught himself advanced mathematics and developed the skills and tools to work out the mathematical relationships of physical phenomena, starting off with the theory of transfer of energy, theory of penetration, field-effect, and the effect of field-effect over trajectory and time. Among several other new theories in interior, exterior, and terminal ballistics, he finally had enough material to write an entirely original book on the science of small arm ballistics, working over a period of more than 20 years.